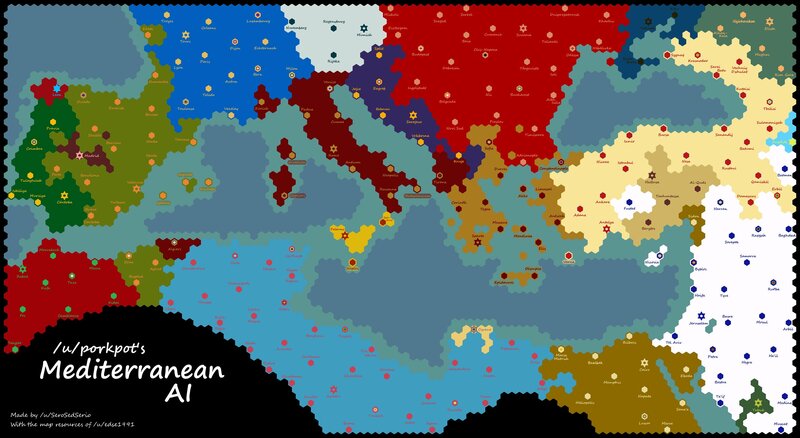 Mediterranean AI - Part: 11 Africa vs the Caucasus - Where is Seen More? Hello all! 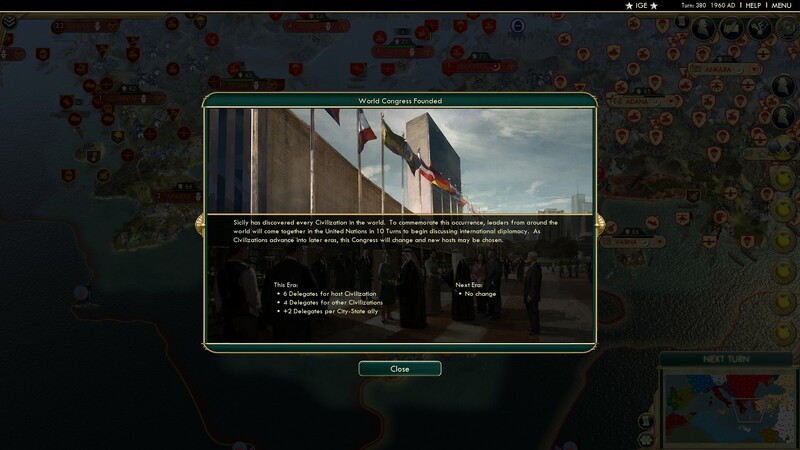 Welcome back to the Mediterranean AI game! I'm glad you're still reading, and as long as people continue to read, I'll continue to narrate and run this type of game. In the poll that was at the end of the last part, 25 votes were cast! Most excellent! Out of those 25 votes, 8 votes were cast for Israel, while the Berbers and Moldavia received 6. The Rashidun received 2, while the remaining 3 were split between the Guanches, France, and the Turks. 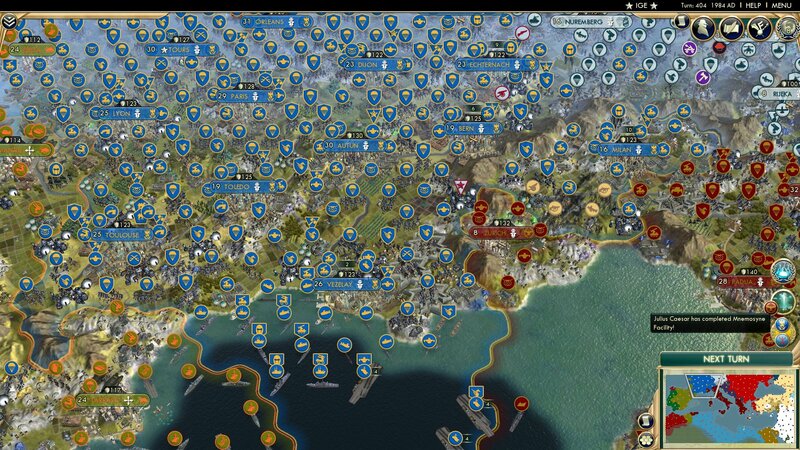 u/SeroSedSerio's map shows us that last part many nations were eliminated, including former Balkan power Serbia. 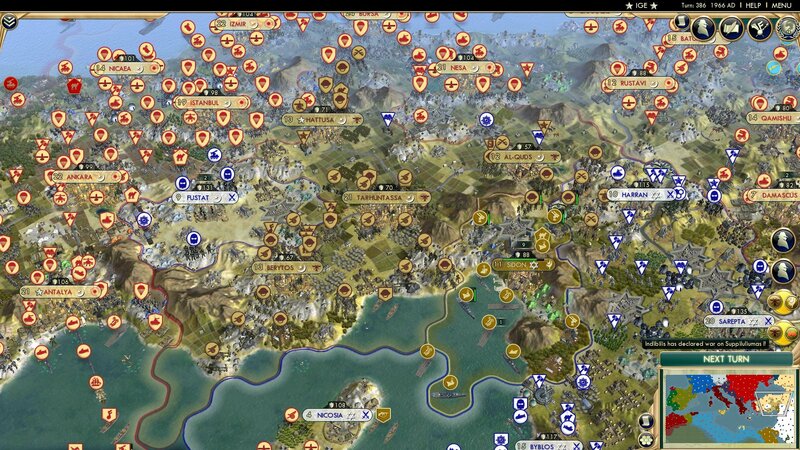 The Berbers greatly expanded their empire, and Moldavia and Rome are currently kicking Sparta. IMPORTANT: I've messed up the ranking somewhere, I think. Everyone has a rank that is one higher than they actually are. Somehow I lost someone, as there are 22 nations left and our last eliminated nation was rank 24. Looks like there won't be an official rank 23, just take everyone's rank from before and increase them, or something. 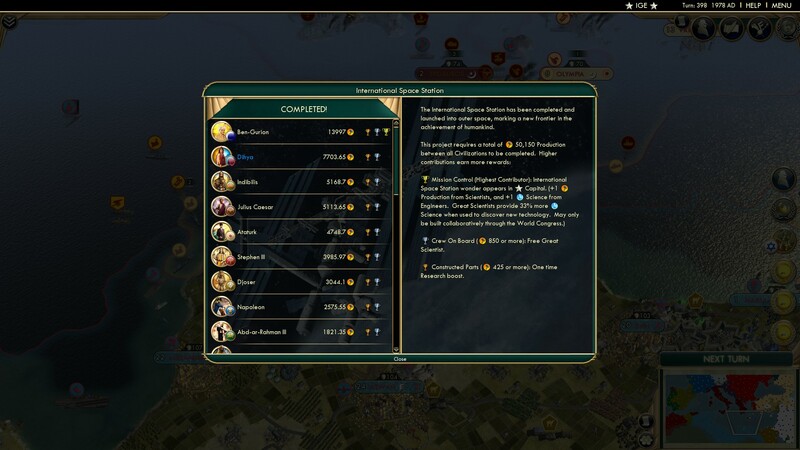 Anyway, I messed up somewhere when counting civs for eliminations. My apologies. To the north, Sparta loses Sofia to encroaching Moldavian forces. 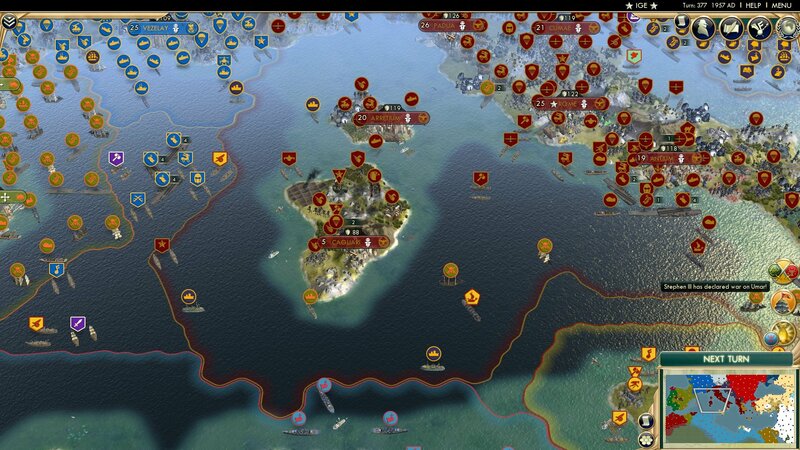 Our man on the inside Nergal also reports that Moldavia isn't too keen on their coalition with the Romans, so they may decide to eliminate their allies. Sparta recaptures their capital, while Rome takes over Corinth. 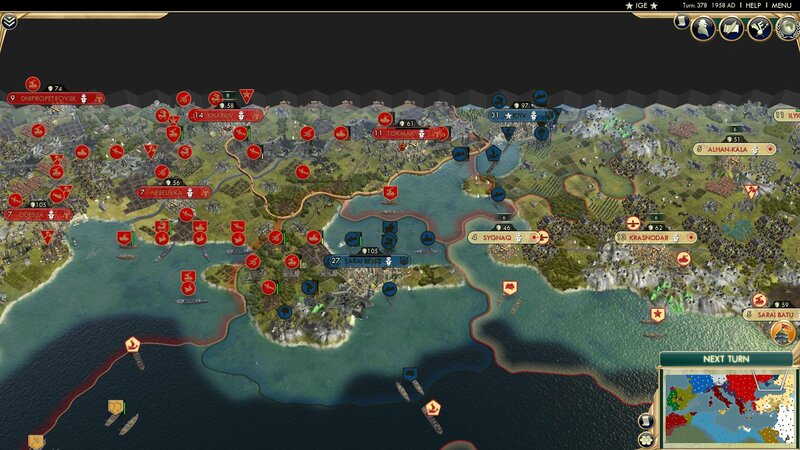 Rome has a series of airborne forces, which are between paratroopers and XCOMS but have shorter range. In the Caucasus, the Alans lose Alhan-Kala, and Maghas looks set to fall soon. Pretty sure that this is to show the magical floating submarine. ALL HAIL THE FLOATING SUBMARINE!!! 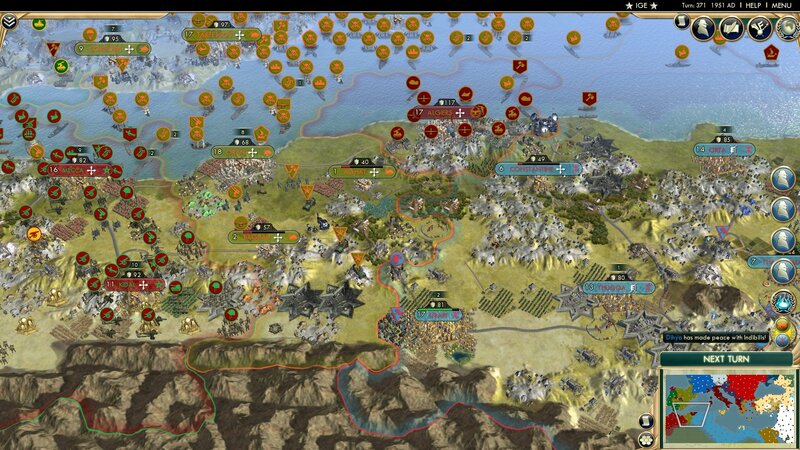 The Berbers make peace with the Iberians, the Iberians gaining Bagdad and Aghat. A good war for the Iberians, though they should reinforce the colonies and use them to stage a takeover of a nearby red coloured nation. 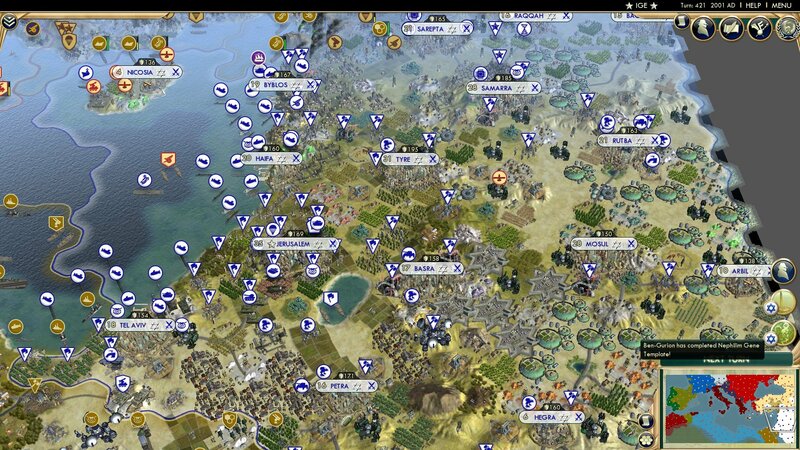 To the east, the Berbers push on into the core of Egypt having taken Heliopolis. 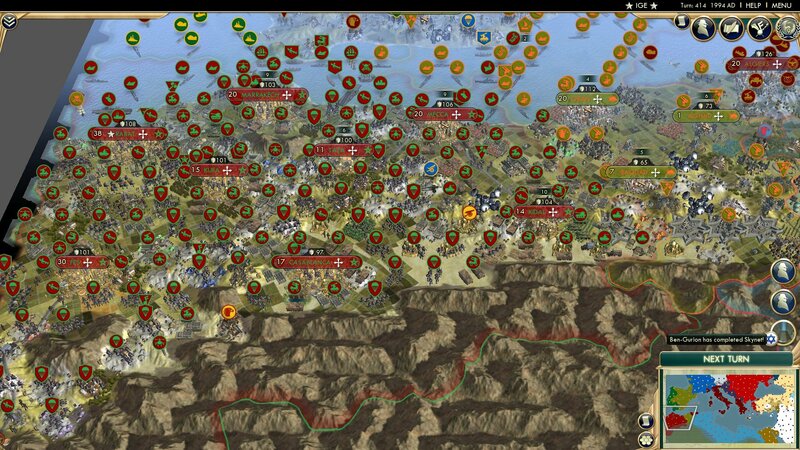 Egypt is gathering its forces around Baalbek and Memphis, though I'm not sure that it'll be enough to hold back the large Berber army. 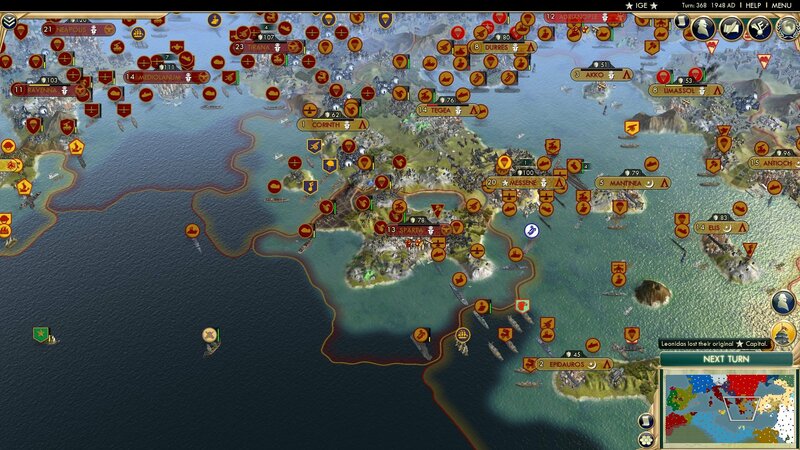 Also, the Iberians may be planning to finish the Spanish off. 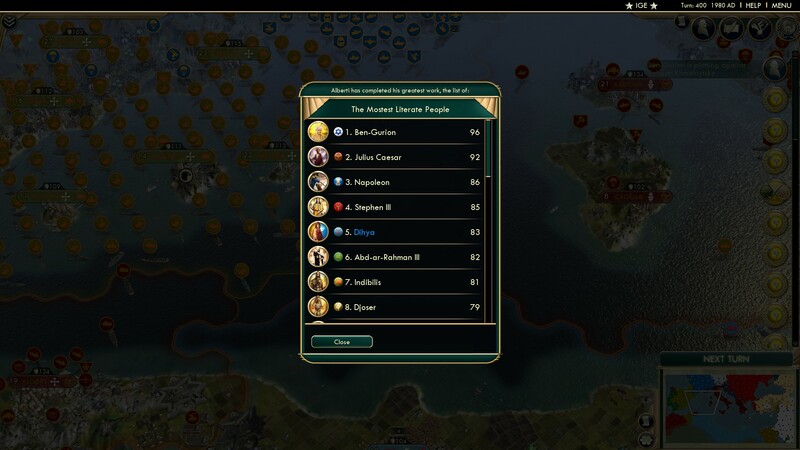 Around the Aegean, Sparta loses Limassol, Cyprus's second city, and Adrianople (still should be spelt Adrienople :D ). Sparta's situation is looking grim. The Alans look finished. Rim Gora has fallen, as has Maghas. Only Elista and Ilyichevskoe are left. 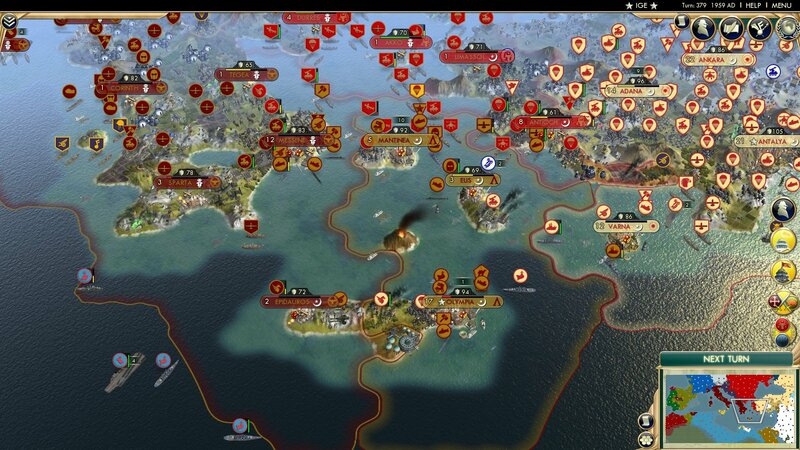 Sparta has lost their capital, but in more positive news they've recaptured Limassol. 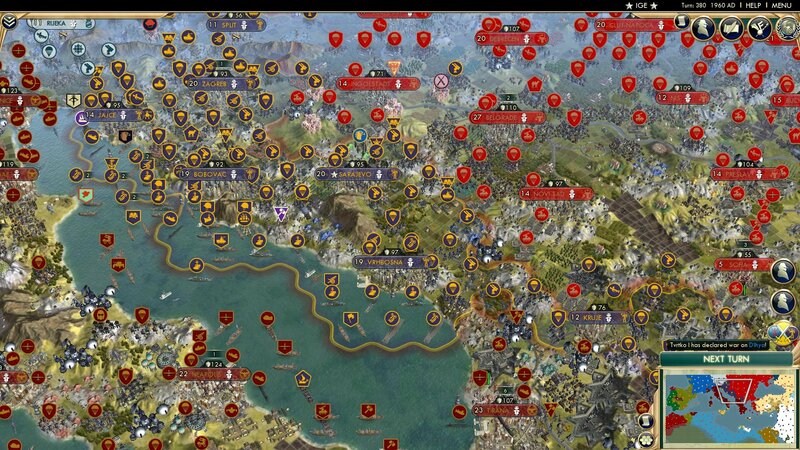 And just like that the Alans have fallen to the Turks' onslaught. 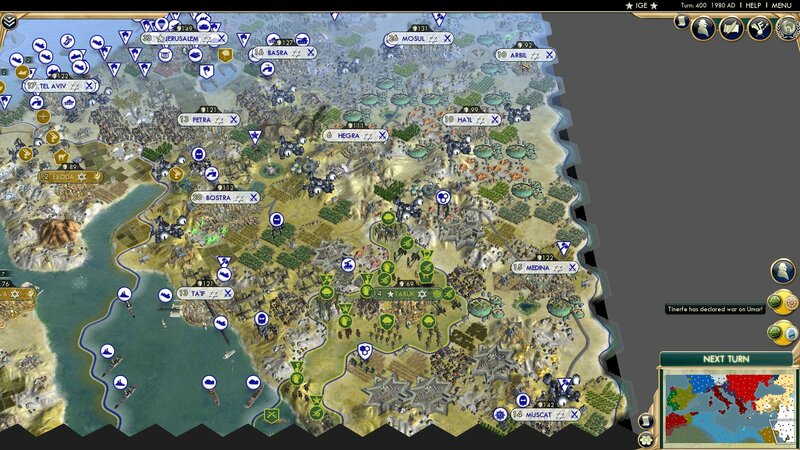 They have forces in the region, but without a production base, they're eliminated even if they flip their capital. The Alans (Rank: 22/58) started in a corner and fought with the Golden Horde and Georgia. 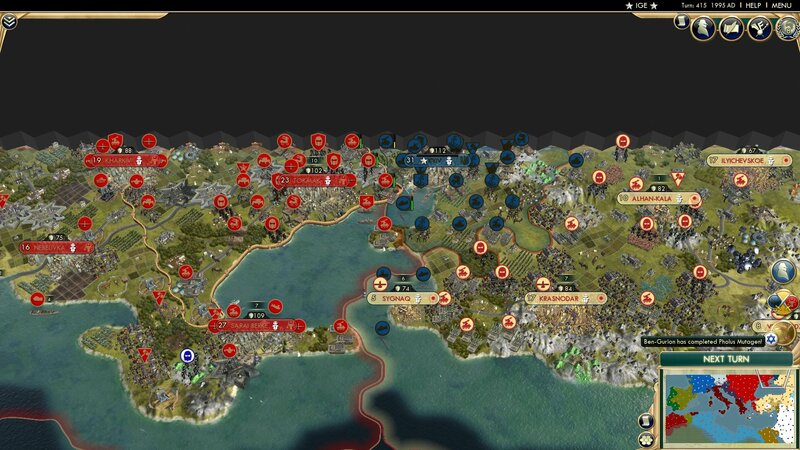 The eventually took out the Horde and tried to advance south, but the Turks put a stop to that and took them out. Shame, as they had a fortress from which to conquer. 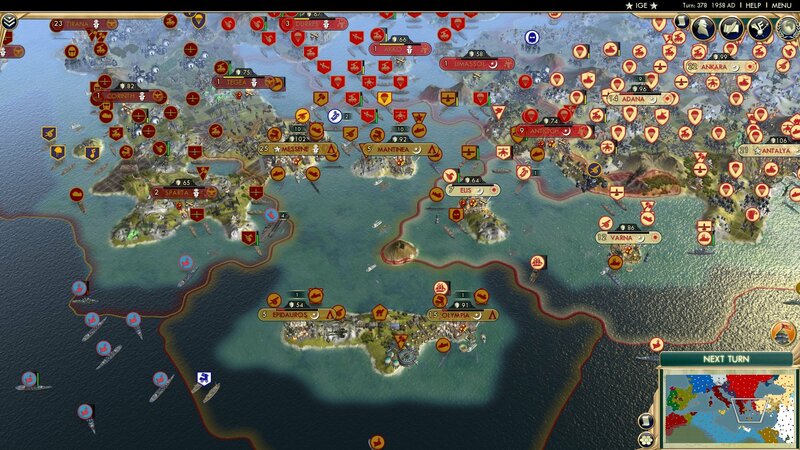 Constantinople and Durres fall to Moldavia , and Sparta hasn't reclaimed their capital yet. Lots of culture in Rome, probably why they survive as one of the few Order/Communism nations. 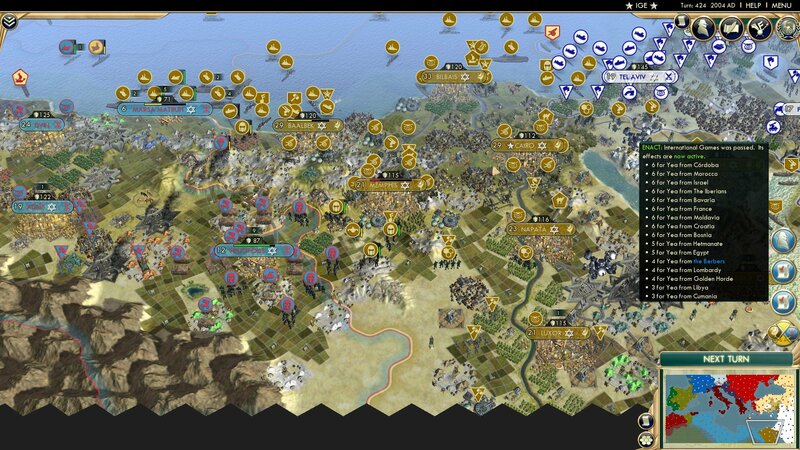 Out of essentially nowhere the Berbers and Egypt make peace. 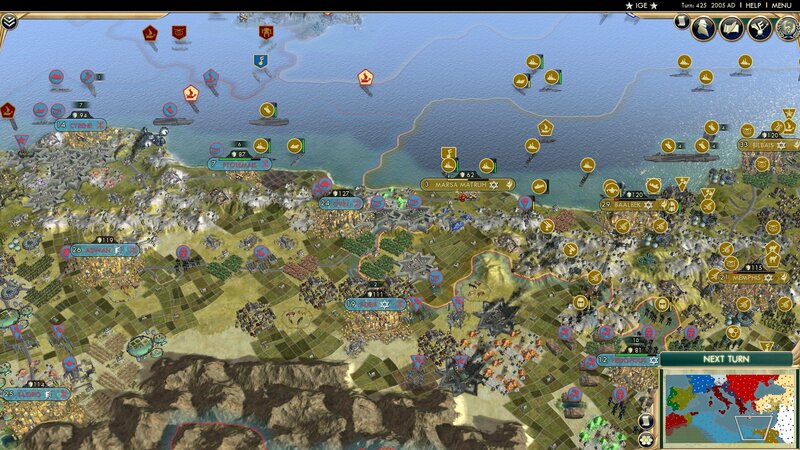 The Berbers made great gains in this war, essentially taking out the Guanches and limiting Egypt's space. 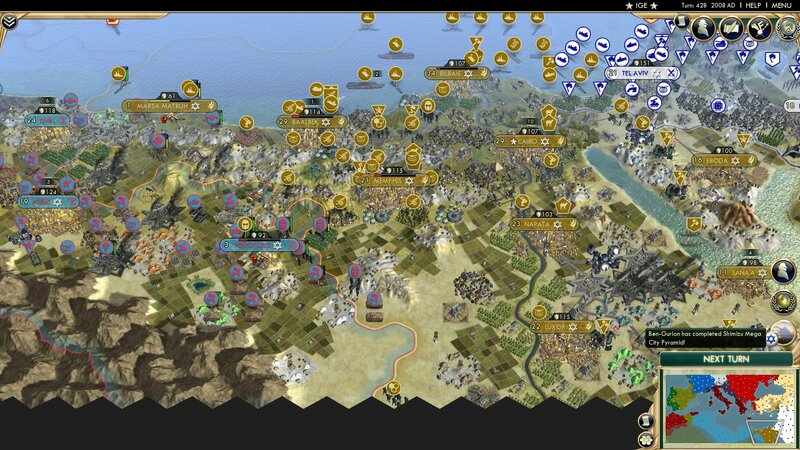 Not content with severely cramping Egypt, the Berbers and Hittites declare war on the Rashidun. Good luck getting there mates. If you look closely, you can see a Nabataean worker. 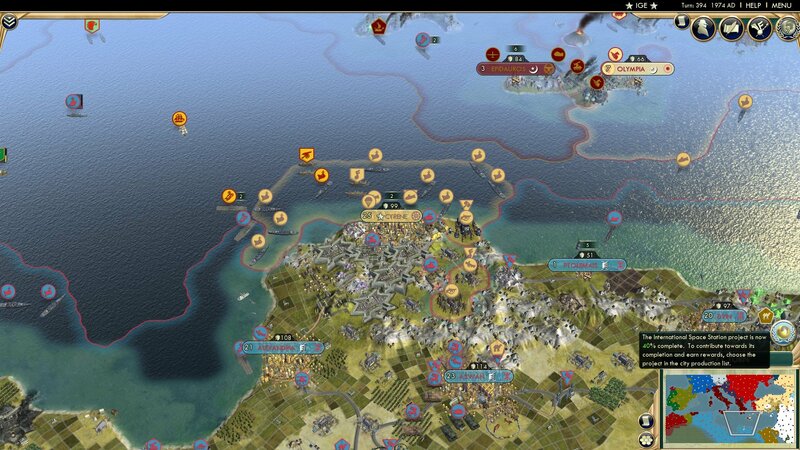 Sparta recaptures Adrianople, but loses Akko in the process. 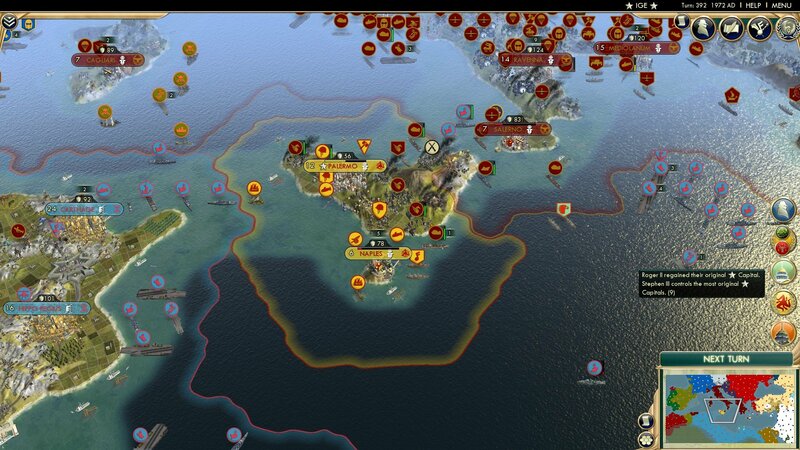 If you look at the map Sparta has their capital. 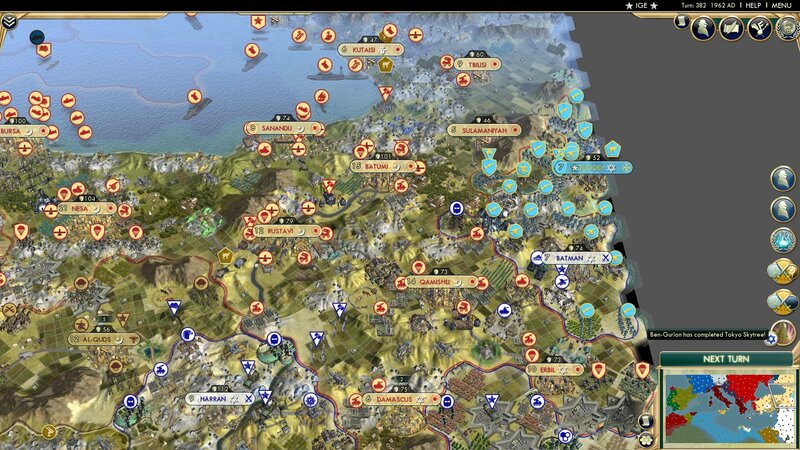 Ah, Akko and Adrianople flip back, but more importantly the Turks have declared war on Sparta and have already enveloped Antioch. Losing the city would deal a grave blow to Spartan air power. 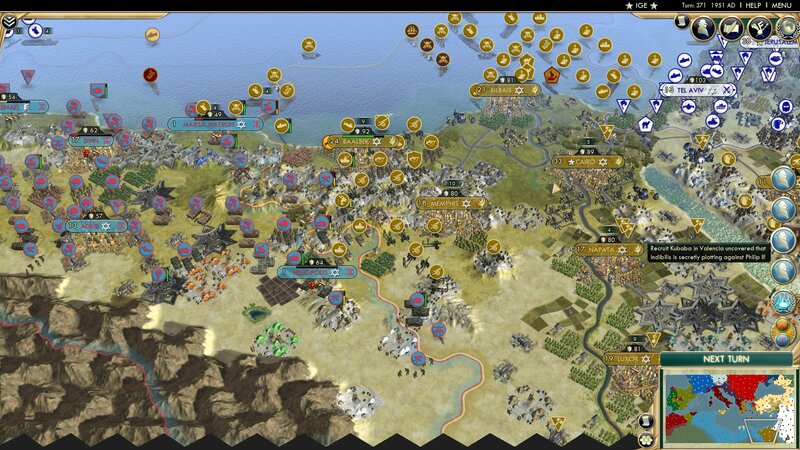 Egypt and the Rashidun make peace, as do the Spartans and the Berbers. 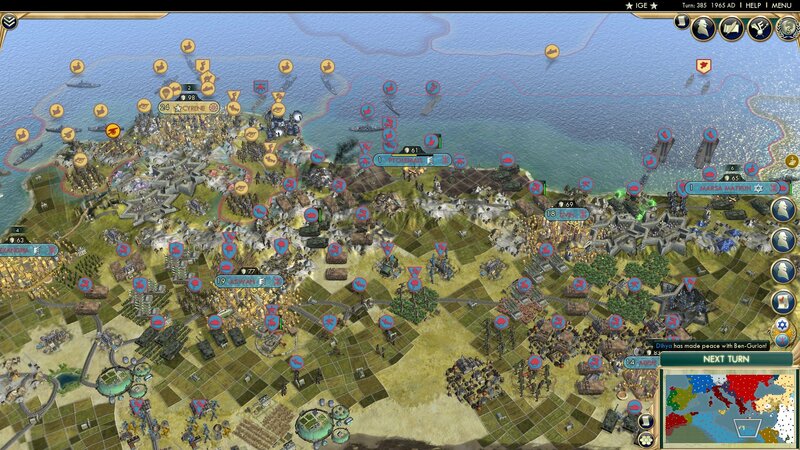 Israel is still at war with the Berbers, however, so they sneak an advanced destroyer into Ptolmais. A largely futile gesture. The rest of their invasion fleet looks like it's in trouble. Sparta loses Cagliari to the Romans. 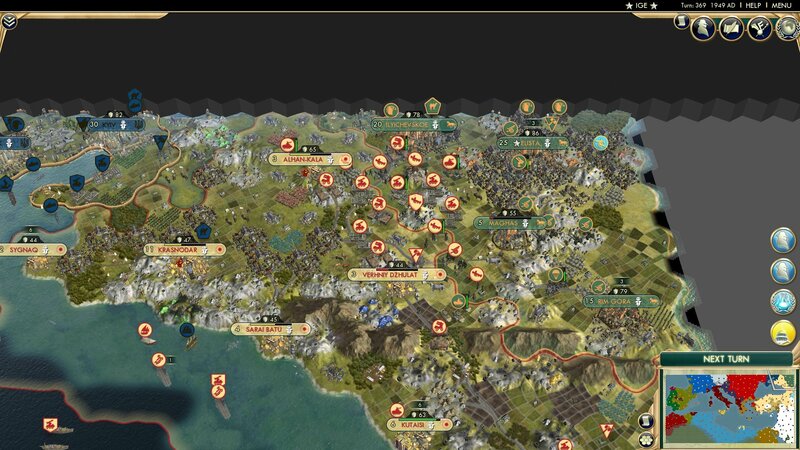 Rome is getting closer and closer to claiming Italy's current borders. 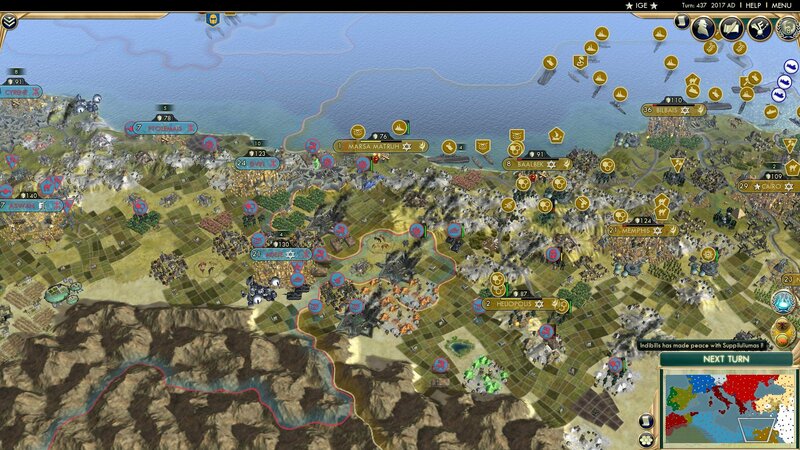 The Berbers develop The Bomb, finally, and the Moldavians declare war on the Rashidun. 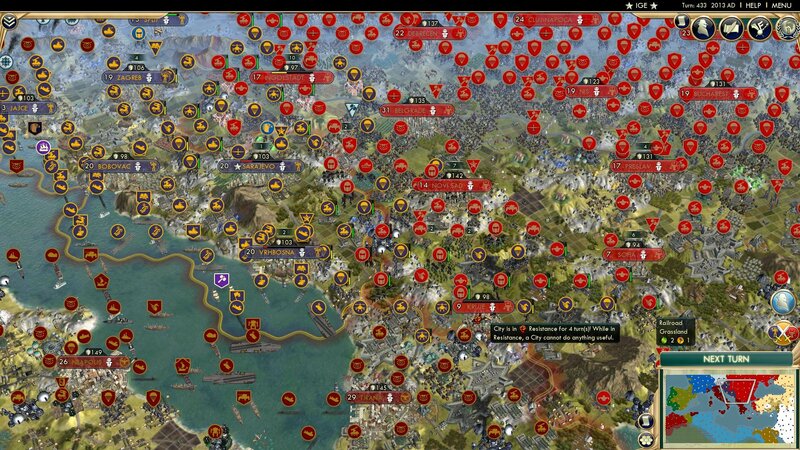 In their war against the Hetmanate, Moldavia has heavily damaged Sarai Berke, and Tokmak isn't doing much bettre. The Turks fail to capture Antioch so the Moldavians do so. 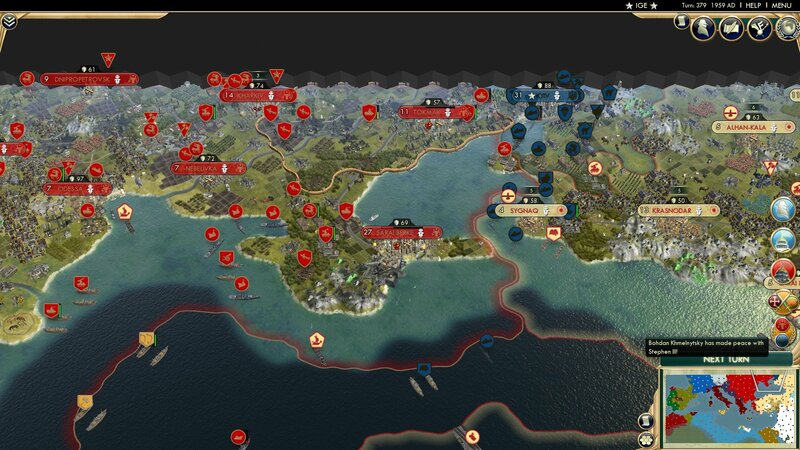 The Turks do manage to capture Elis though. Rome manages to capture Tegea. 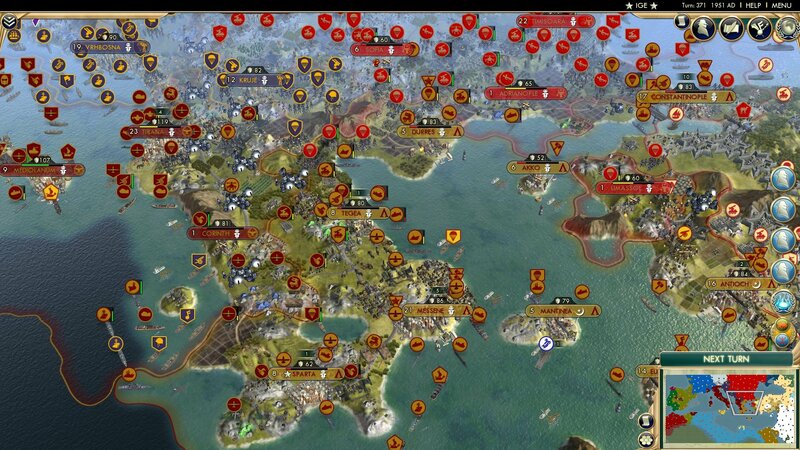 Moldavia captures Tokmak, adding another capital to their collection. Rome captures Messene and Epidauros, while Sparta recaptures Elis. 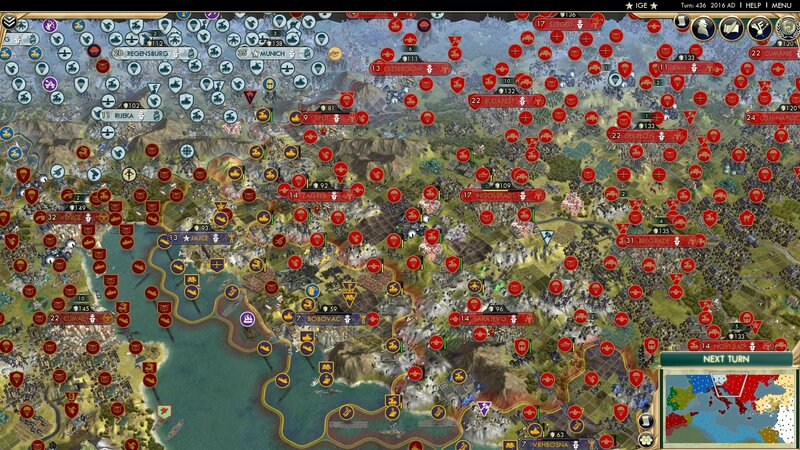 The Iberians declare war on Spain, this shouldn't last long. The Hetmanate and Moldavia make peace, the Hetmanate only remaining in Kyiv. The World Congress/United Nations is finally founded by Sicily of all nations. Whatever, better late than never I suppose. 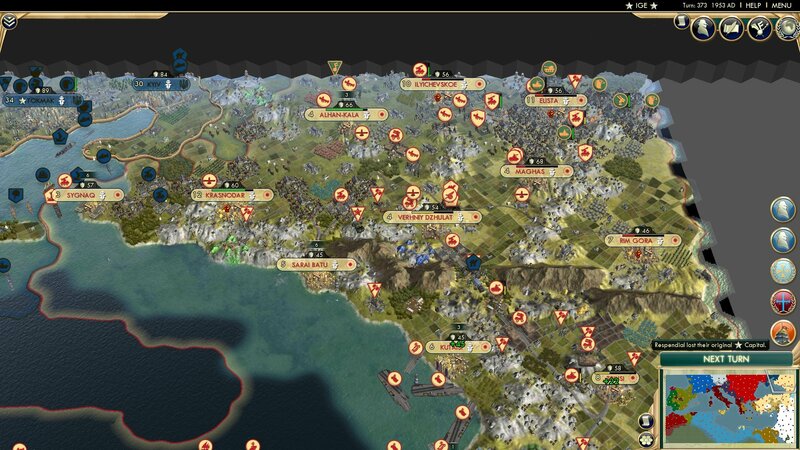 For some reason, the Bosnians have declared war on the Berbers. I'm sure we'll figure that one out some other time. 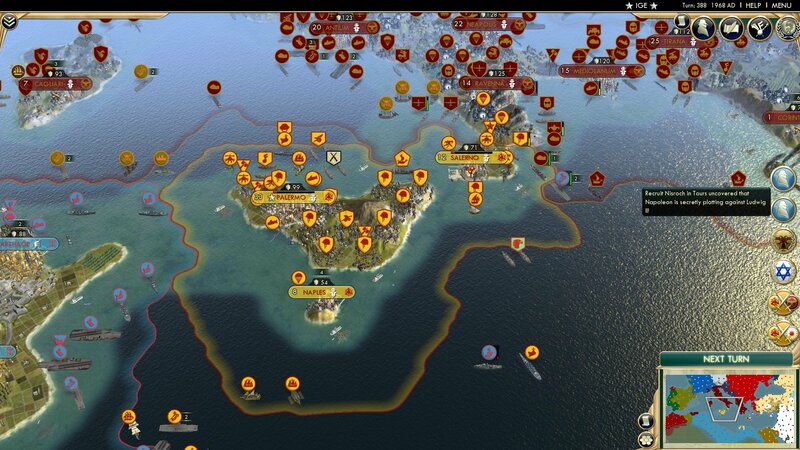 Spain is gone, that didn't take long. 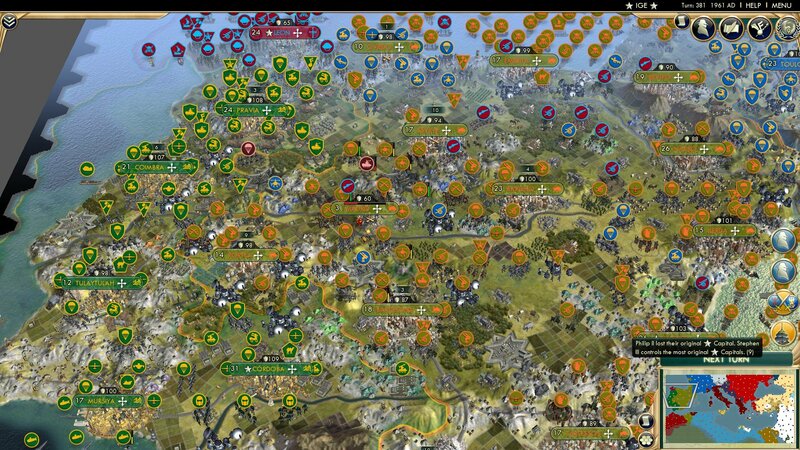 Spain (Rank: 21/58) didn't do much, they founded a few cities, fought ineffective wars, and were then were absorbed by the Iberians. Poor show by Philip II. France joins in with the Bosnians, and declares war on the Berbers. 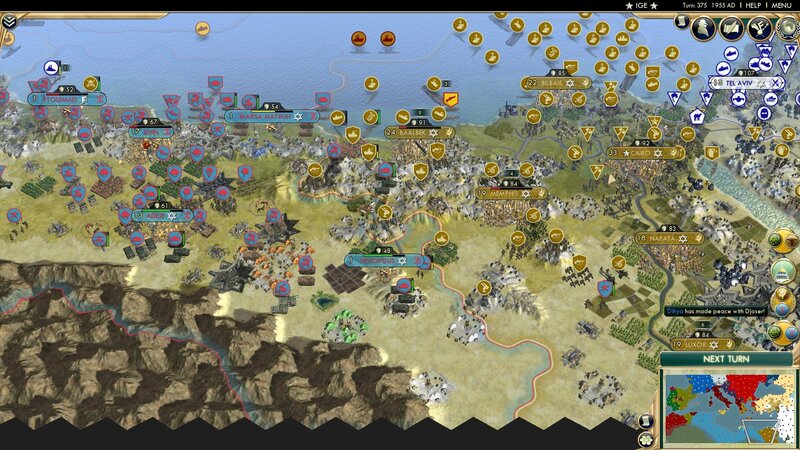 At It looks like they mean business, but they'll need a lot more than two melee units to keep a city from the Berbers. 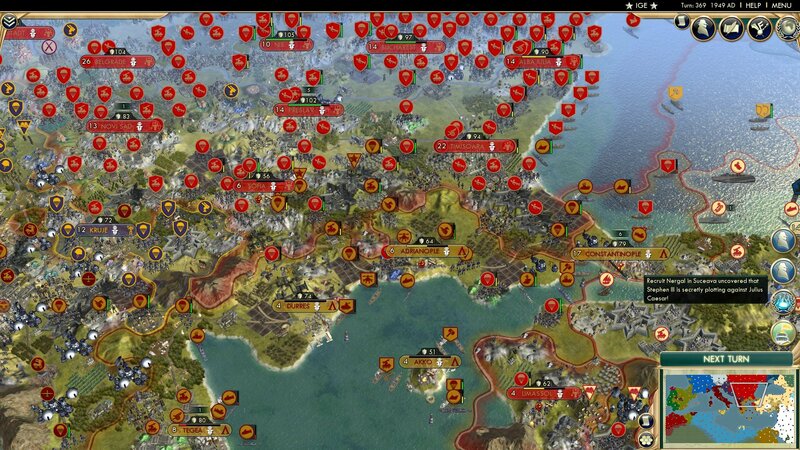 Sparta has been eliminated by the combined forces of Turkey, more Moldavia, and even more Rome. 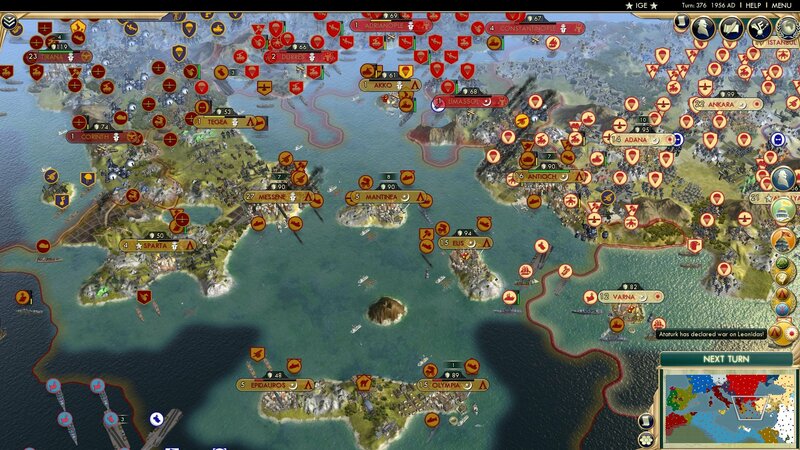 Sparta (Rank: 20/58) started well, founded a series of cities up their peninsula and on the Aegean Islands. 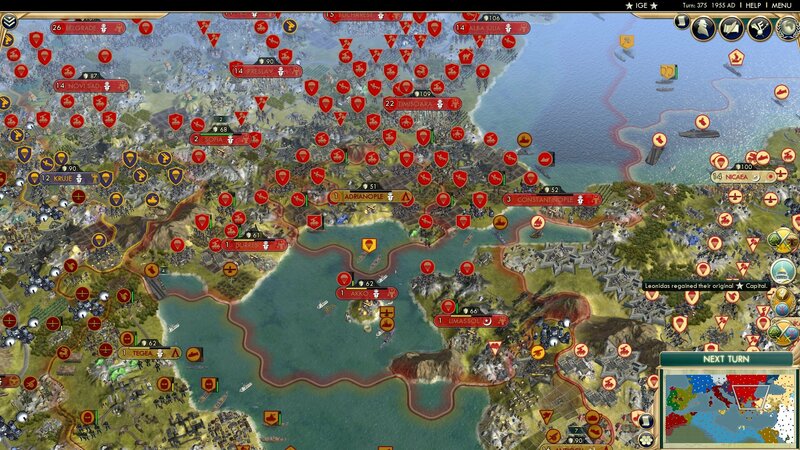 They expanded to to take out the Albanians, Bulgarians, and Byzantines, but a series of costly wars with Rome caused them to lose manpower and cities until Moldavia joined in to finish them off. Farewell Leg Day. 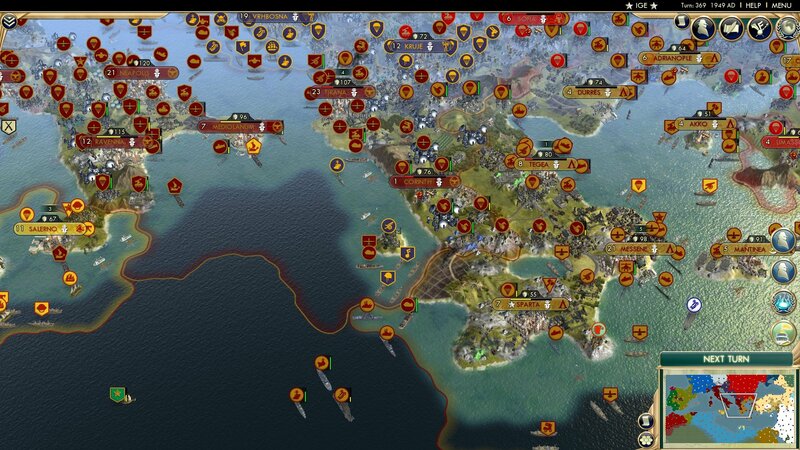 Egypt and the Hetmanate want to feel bettre after their losses to the Berbers and Moldavia, and so declare war on Georgia. Also, Israel builds the Tokyo Skytree, which grants 1 happiness and 1 cultures from each broadcast tower. If anyone cares, Israel built Jurrasic Park last part, which grants 2 science, gold, and happiness for each zoo, and dinosaurs may spawn as barbarians until the discovery of the designer lifeforms tech. They also built the Helios Microwave Power Satellite, which doubles the yields of Solar Plants, and causes them to act as citadels to enemy units. 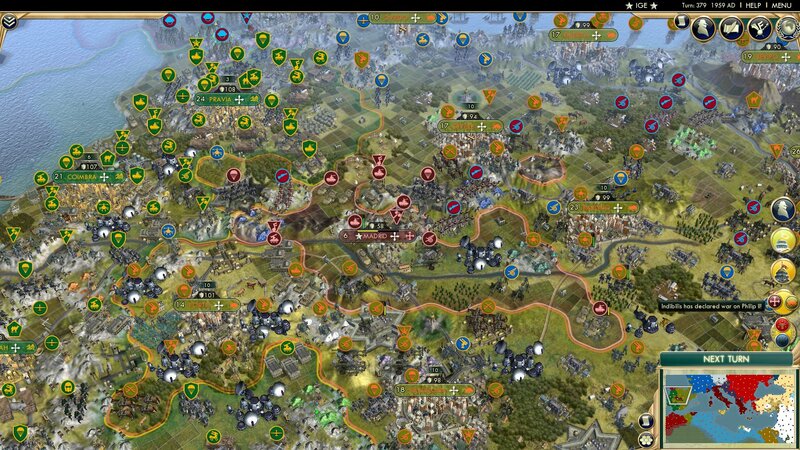 As is expected, the Berbers recapture Ptolemais, and then make peace with Israel. A bit of a disappointment, that war. 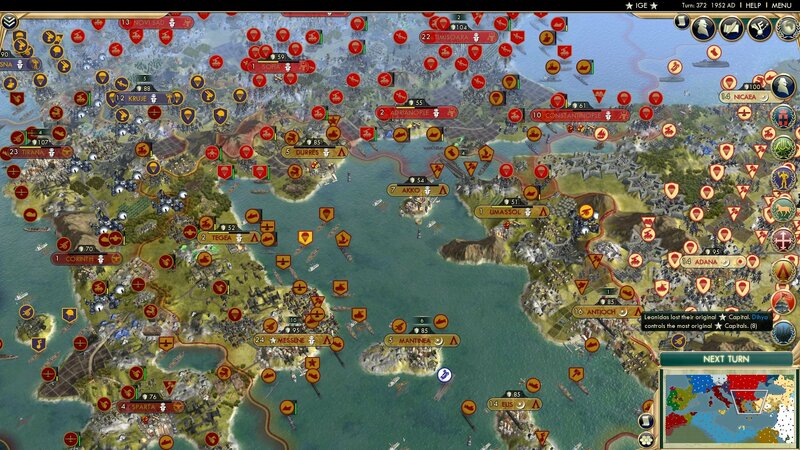 The Iberians and Egypt declare war on the Hittites, though if there's any justice in this rectangle the Hittites will recapture Sidon. 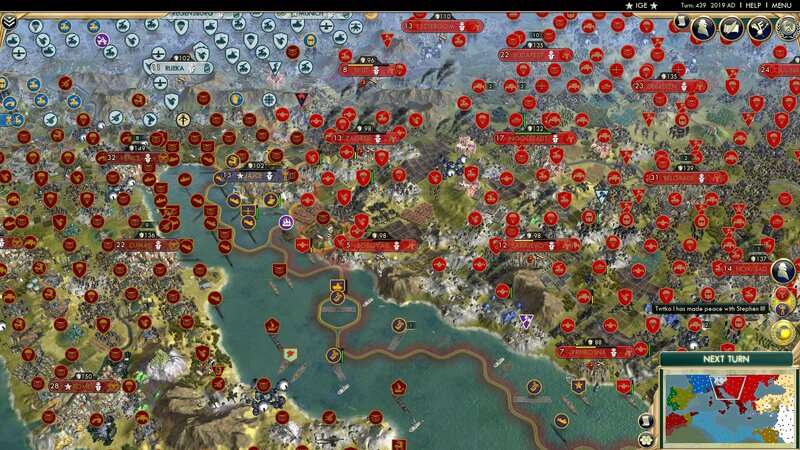 The Turks, ignoring the Hittites, have teamed up with the the Romans to take out the Sicilians. Rome will soon be able to form Italy. France vs Bavaria possibly? We'll see. 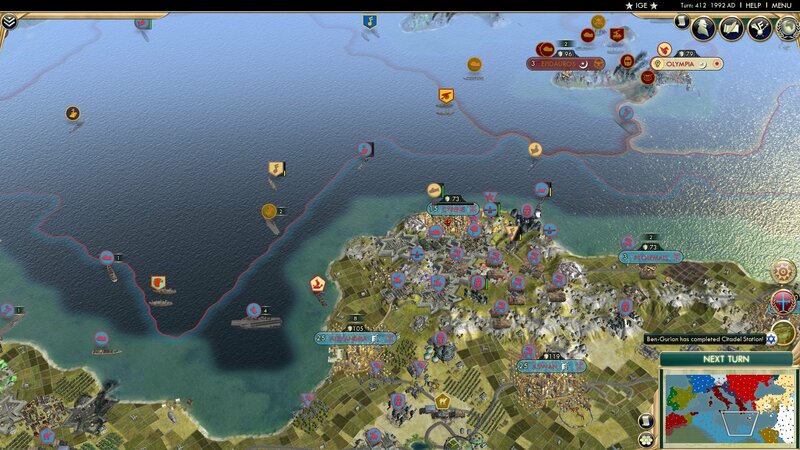 Salerno falls to Rome, as is expected, and the Berbers make peace with the Rashidun in a war they never should have declared. 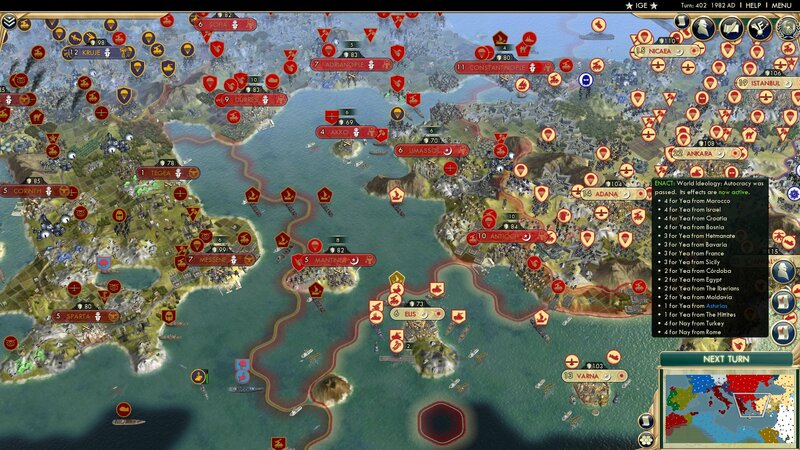 Even though they made peace with the Berbers, Sicily and Asturia think that they can rid the world of the Rahidun threat. Palermo flips, and Naples is looking pretty damaged. And there they go... That was quick. 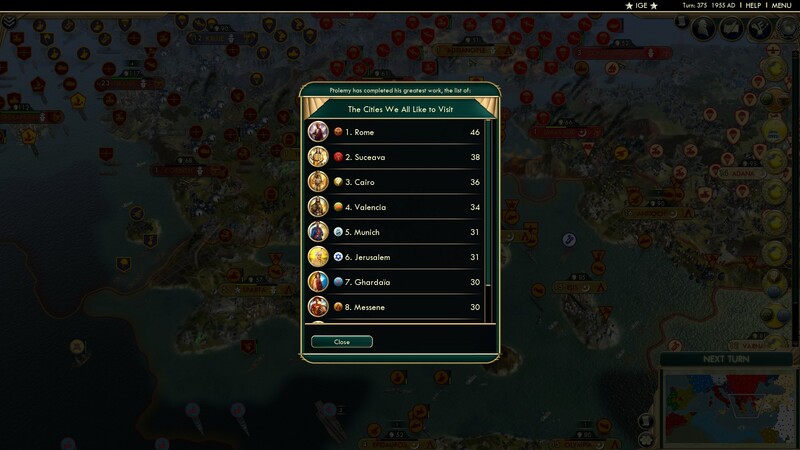 Sicily (Rank: 19/58) didn't accomplish much, though they did build the Great Library. 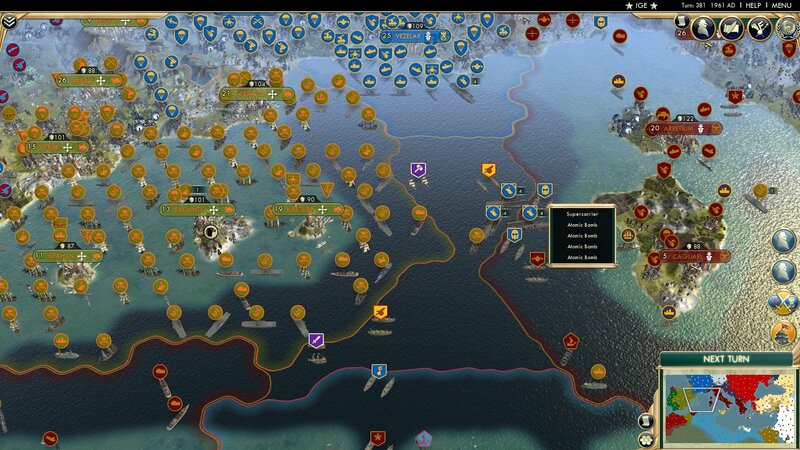 They then took forever to found Salerno and Naples, and then did nothing until they died. All Rome needs to be Italy is Milan, though they'll have to fight the French for it. 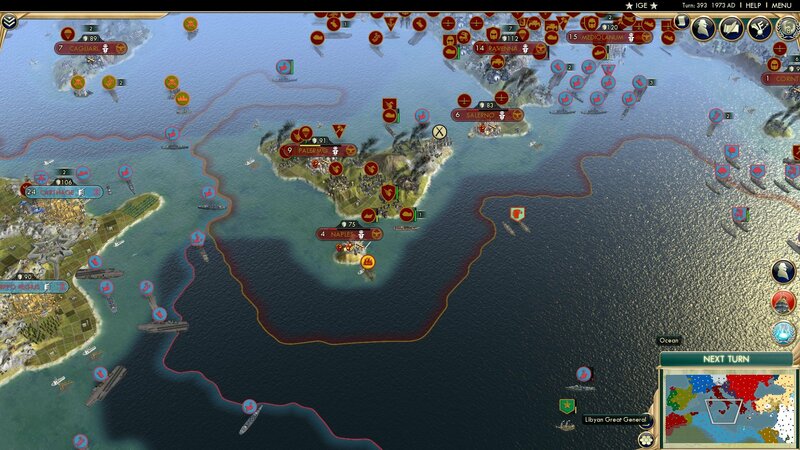 The Berbers have citadelled the crap out of Cyrene, leaving the Guanches with 4 tiles on land, including their city. The ISS is 40% complete. Oh, well, that was quick. We can see what Israel has been working on. They also lead the tech game. The Guanches and Bavaria declare war on the Rashidun. I have no idea why we're looking at this area, likely because Rome and Turkey are the only non-autocracy nations that I can think of at this moment. Israel finishes the Orbital Refinery, which grants additional nanomaterials and extra production to buildings that produce nanomaterials. 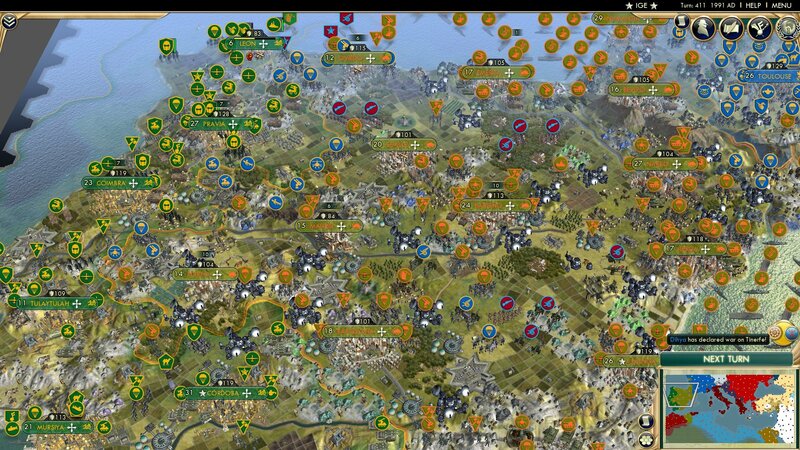 The Bosnians have nicely carpeted, though it would be rather meaningless if the Moldavians attack. Bosnia makes peace with the Berbers. France follows suit, with both the nice carpet and making peace with the Berbers. 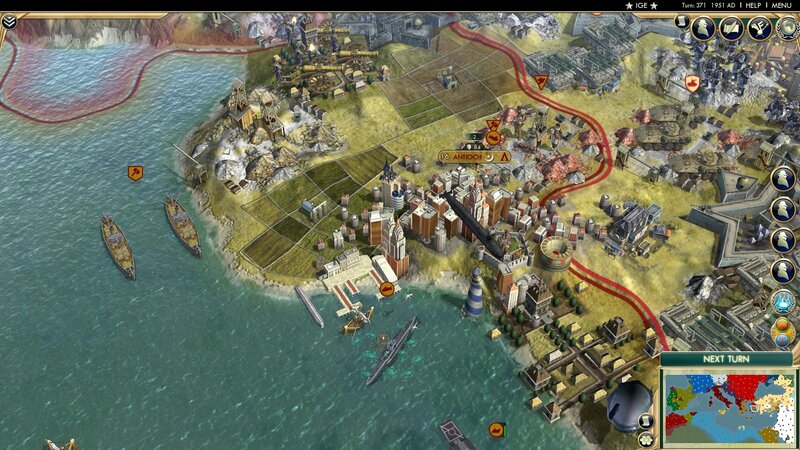 Rome builds the Mnemosyne Facility, which grants units built in the city that built the wonder extra XP, up to 60. I like the small Guanchean expatriates near Milan. 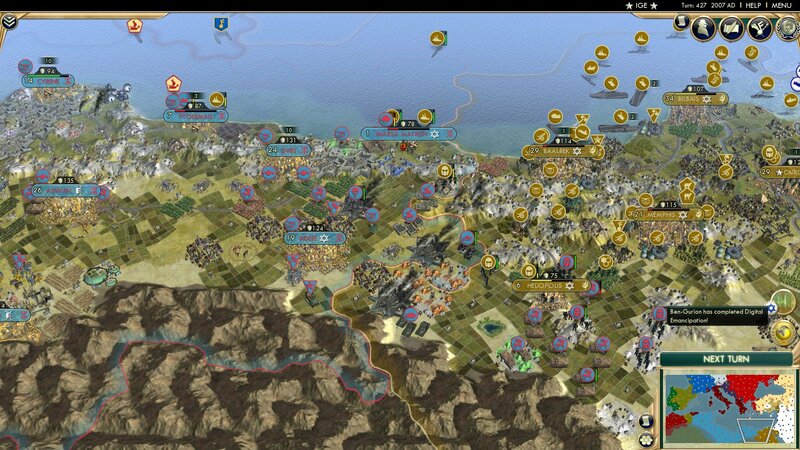 Iberia declares war on the Rashidun, the Hittites stop war. Israel builds the Utsade Gene Vault, which has the vague description of boosting less used tile improvements. 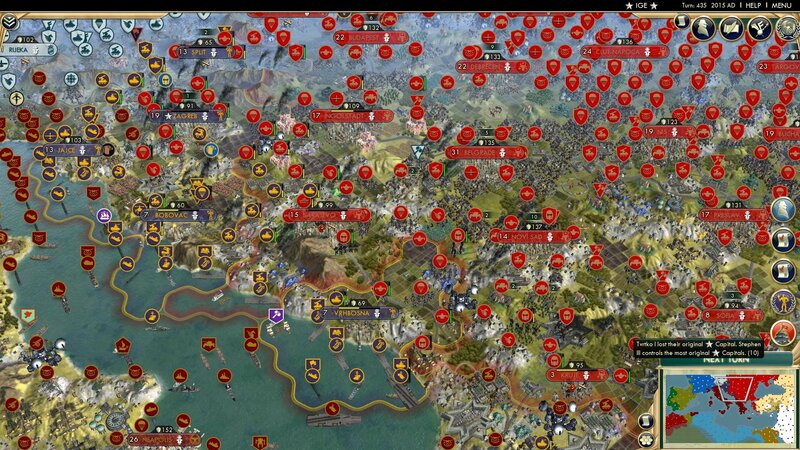 All of a sudden the Cordobans declare war on Asturia and the Rashidun, while Israel, the Hetmanate, Egypt, and Bosnia declare war on the Rashidun. I may or may not remember this correctly, but I think the Rashidun went freedom. Yup, they're screwed. Those are Israeli hover tanks, battlesuits, organic infantry, and automatons. I'm not going to describe what they all do, but they all have power ratings higher than Tabuk's defensive rating. Leon is almost taken out, I'm pretty sure Cordoba's got this. And we're back already with the elimination of the Rashidun. The Rashidun (Rank: 18/58) (We're down to fewer than 20 civs!!!) 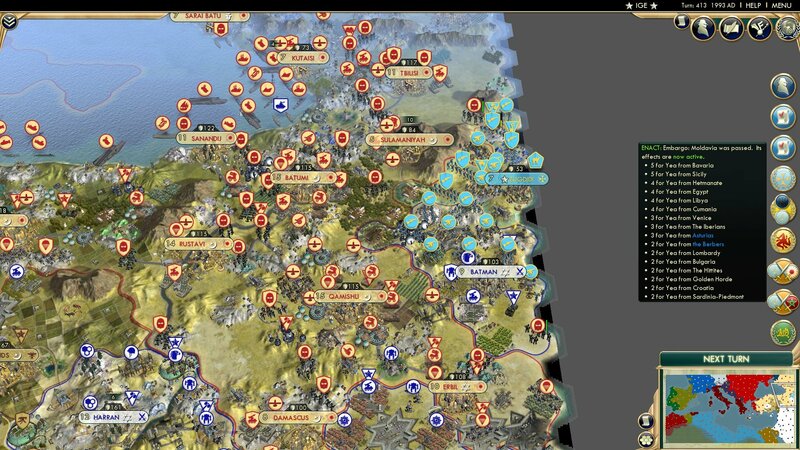 started off strong, crippling then conquering the Nabataeans, then attacking into Egypt and Iraq, but Israel managed to bring them to heel, likely because of their UA which basically fed them a military. 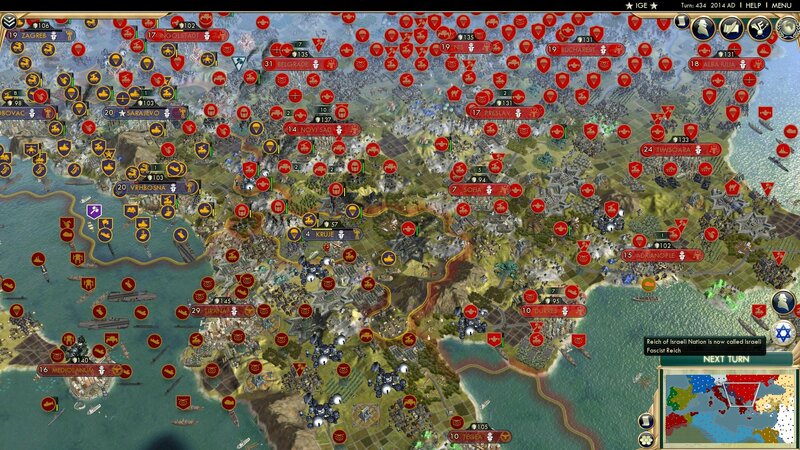 There goes the Asturians, falling to the Cordobans. They did manage to flip their capital once, but that was all. 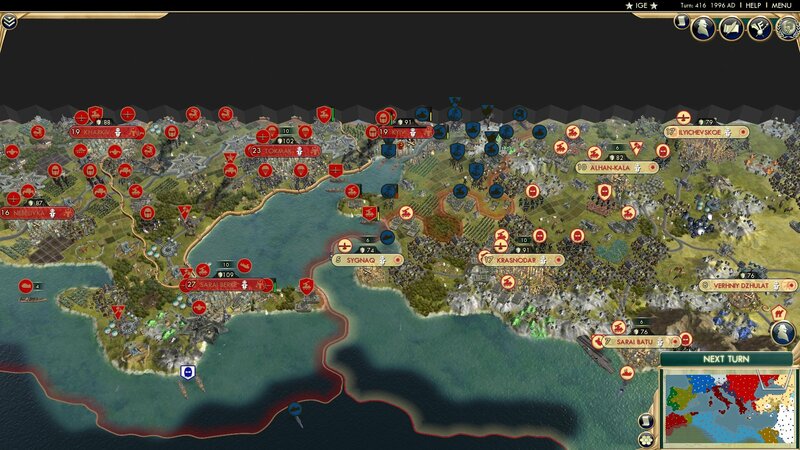 Asturia (Rank: 17/58) founded a few cities but was boxed in by the Spanish and Portuguese. 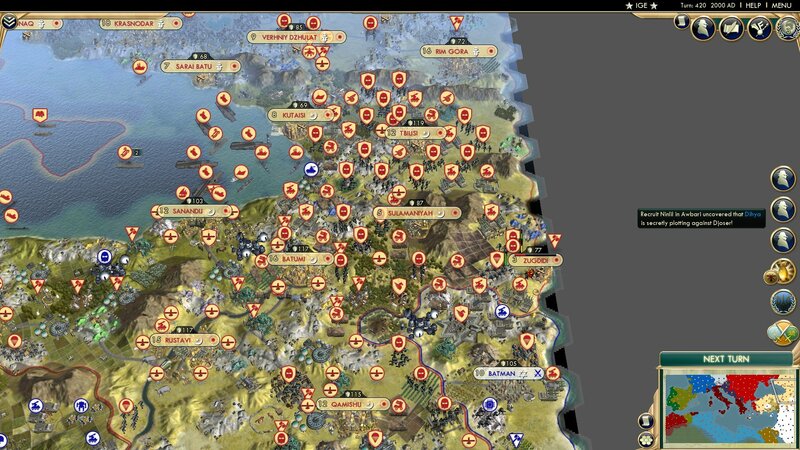 They tried to expand but failed to do so, so they were eliminated by the Iberians and Cordobans. 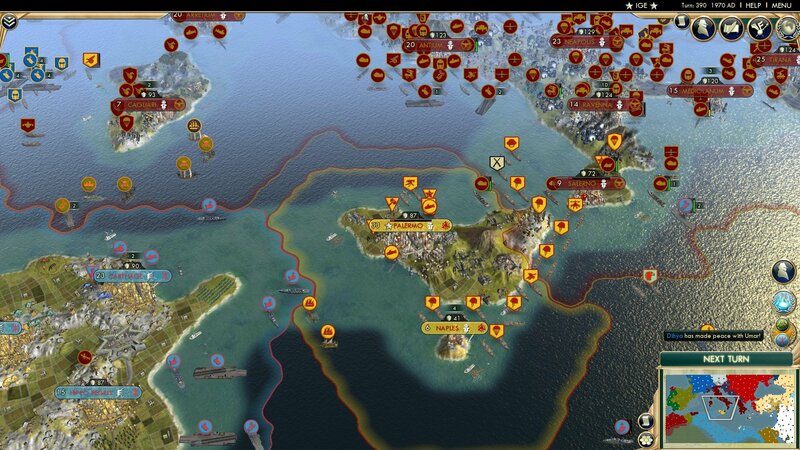 You probably saw last slide that the Berbers eliminated the Guanches. Yup, that quickly. Israel builds the Citadel Station, granting 2 science and gold from scientists, and 2 production and gold from engineers. 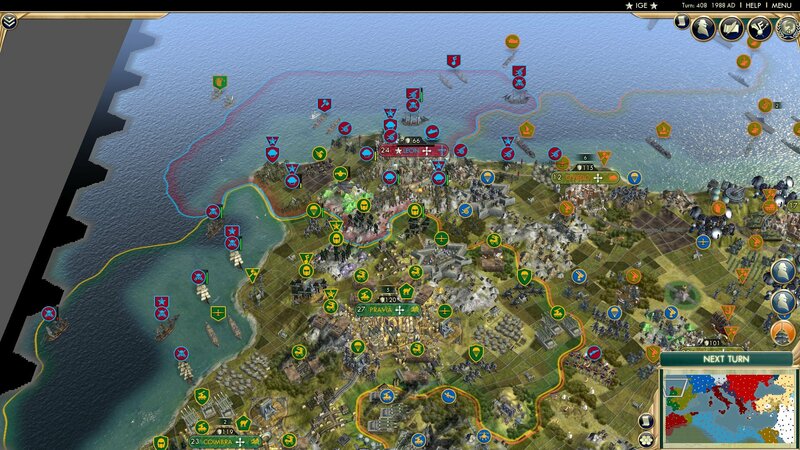 The Guanches (Rank 16/58) started off strongly, taking out the Ptolemies and helping to take out the Ayyubids, but then stagnated and failed to reduce the Berbers' strength. 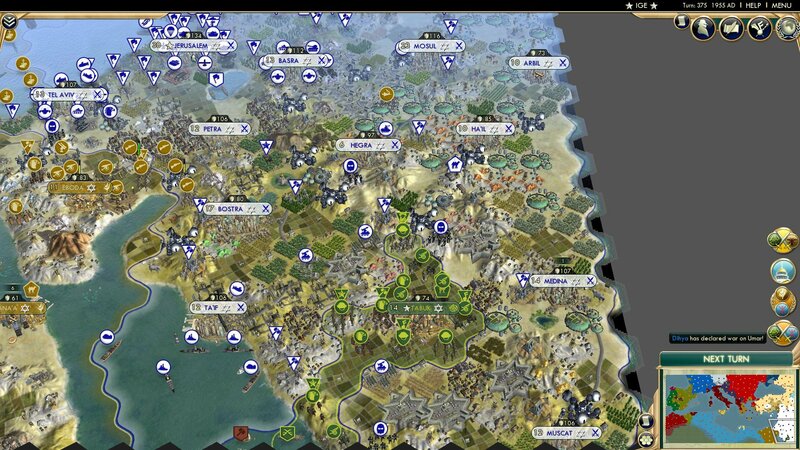 The Berbers took them out with exact precision, so now they roam the globe. 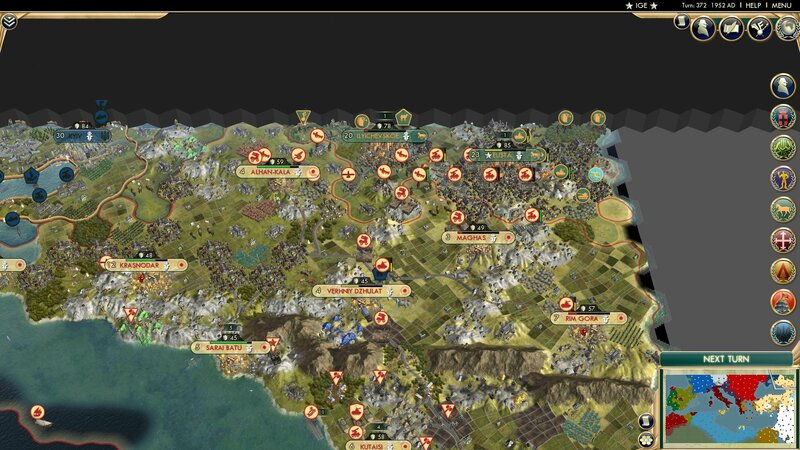 A bit late for 4 eliminations in 4 slides, but Turkey and Morocco declare war on Georgia, while the Hetmanate makes peace with them. Not that it'll stop much, but Moldavia is embargoed. 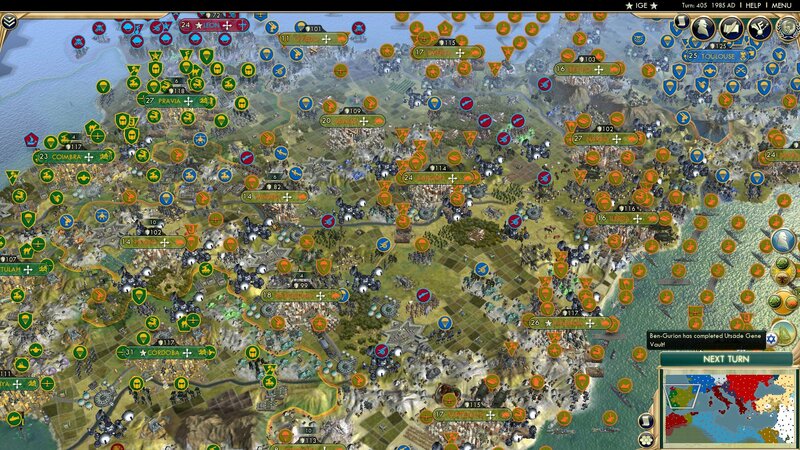 Morocco has also carpeted up, though with almost no FW units it's essentially cannon fodder. They should go after the Iberian colonies while they're undefended. Israel builds Skynet, granting an extra 10% boost to combat across the board. So... Robot/Virtual Jews? 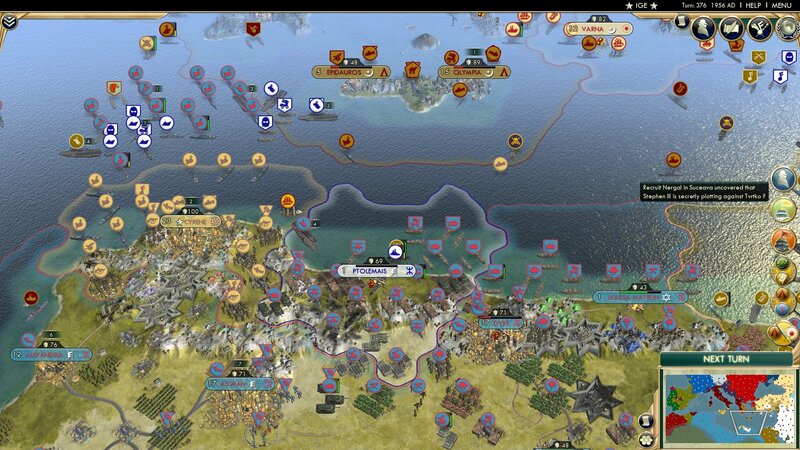 Moldavia goes to finish off the Hetmanate. Israel builds the Pholos Mutagen, granting units the Gengineered promotion for free, and will potentially result in fungal growths on any tile with a biological improvement (farms, grasslands, those kinds of tiles). And like that, the Hetmanate is eliminated. They'll manage to flip the city once, but that's all. 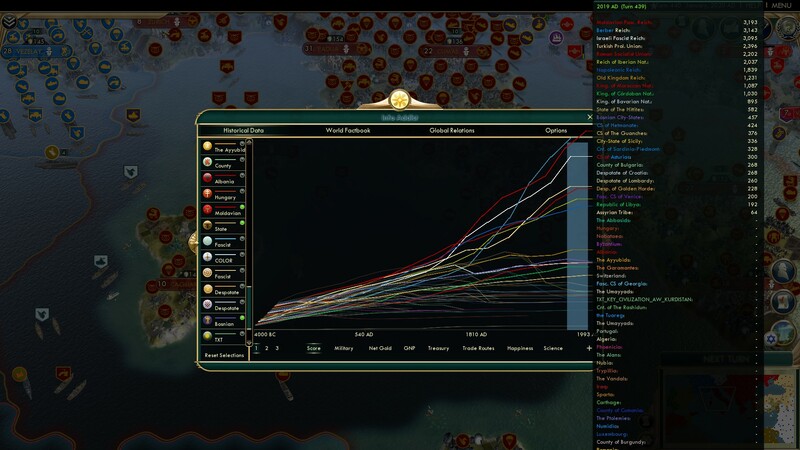 The Hetmanate (Rank: 15/58) founded few cities but were consistently high in the technology and population rankings. 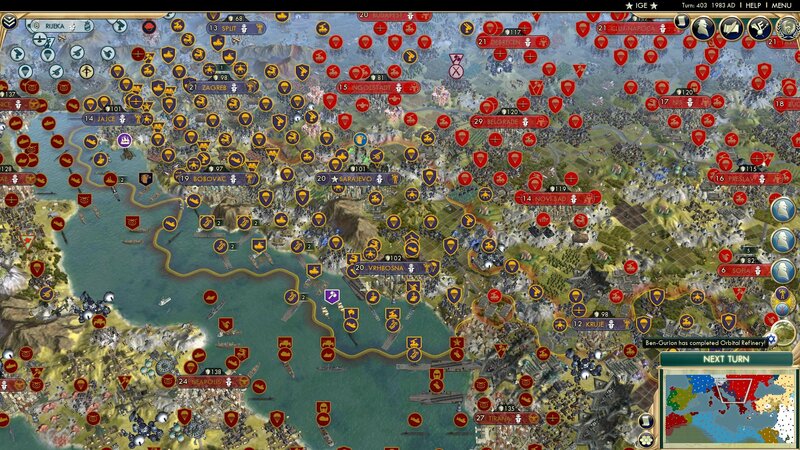 They took a city off of the Golden Horde and fought some wars against the Trypillians, but never expanded enough to be able to resist the eventual Moldavian attack. 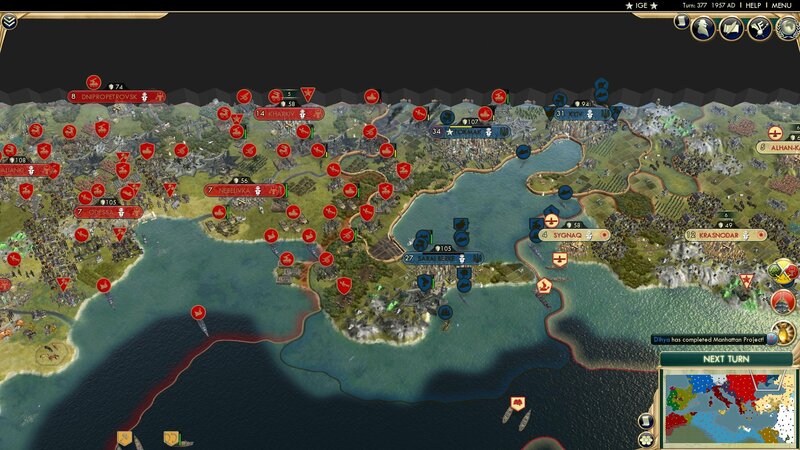 4 turns later, the Turks get around to finishing off the Georgians. Georgia (Rank: 14/58) didn't do much of note, to be honest. They fought the Golden Horde and Alans, as well as the Kurds and Turkey, but never grew as a result. The Alans took out most of their cities, then the Turks took those cities and then Georgia. That's about it. Israel builds the Nephillim Gene Template and the Bionic Tower. They grant each city 1 production, gold, and science per 2 citizens, and reduce specialist unhappiness and food consumption, respectively. 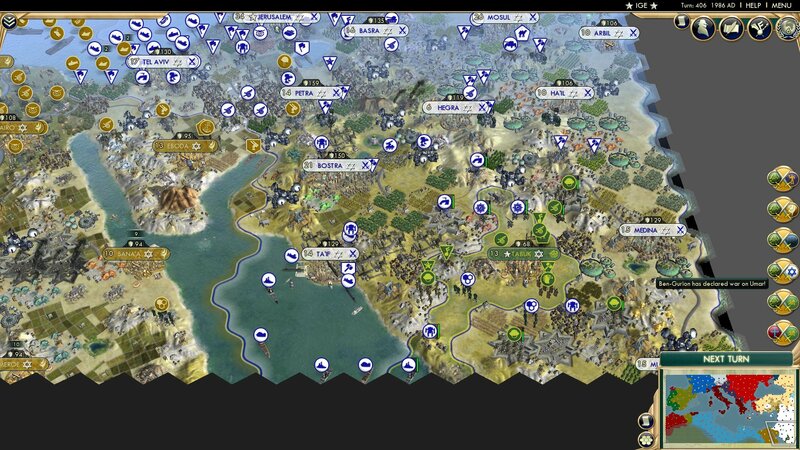 The International Games are passed as the Berbers resume the attack on Egypt. 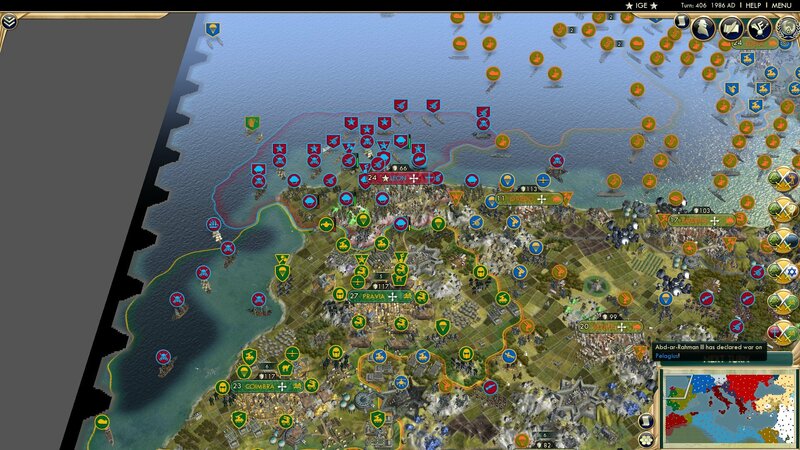 Egypt manages to capture Marsa Matruh, which is surprising. This is more what I expected. Israel builds the Digital Emancipation wonder. 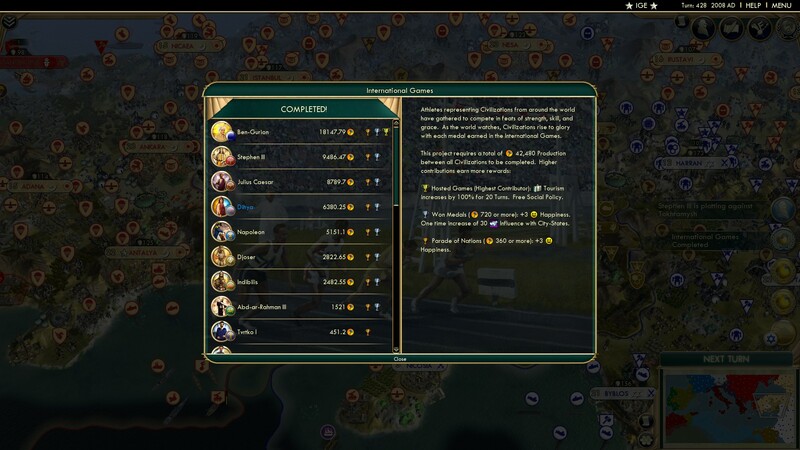 This grants 6 science and culture from every AI Network and 8 production from every Drone Hive, both buildings don't cost any maintenance (which at this point in the game is likely irrelevant), and yields from uploaded citizens are increased by 50%. Again, Israel wins a production contest. Please stop building wonders Israel... They build the Shimizu Mega City Pyramid, granting 20 production, gold, and science in the city, as well as removing all building maintenance in that city. It also provides 2 happiness for autoplants and drone hives. 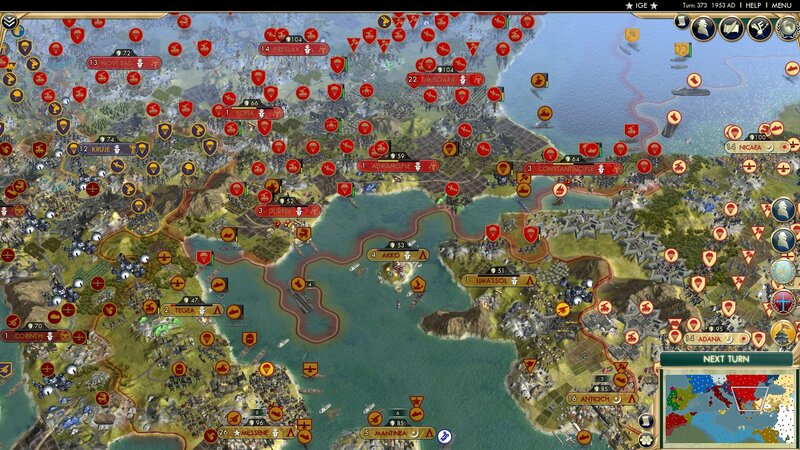 All western Egyptian cities are in the red, though they did recapture Marsa Matruh. Bloody wonderwhoring... 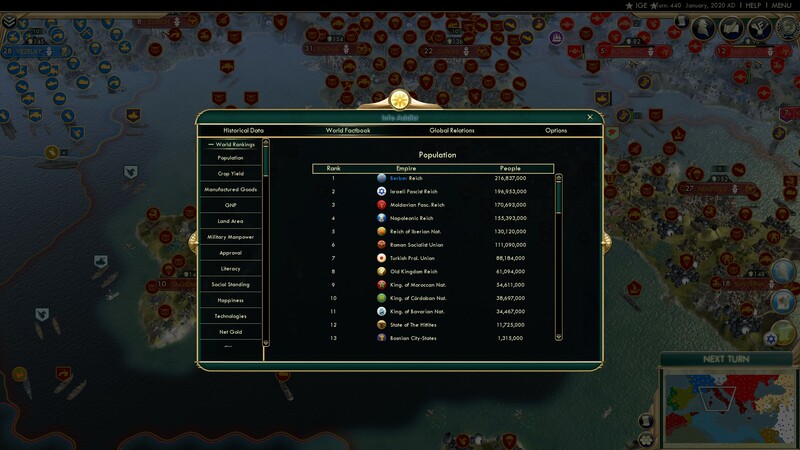 The Buenos Aires Forum increases Golden Age length by 50% and makes you gain golden age points for every citizen in your empire per turn. This seems wildly OP... The Ultima Tower grants each city 2 citizens and 10 happiness. Egypt and the Berbers flip Baalbek. 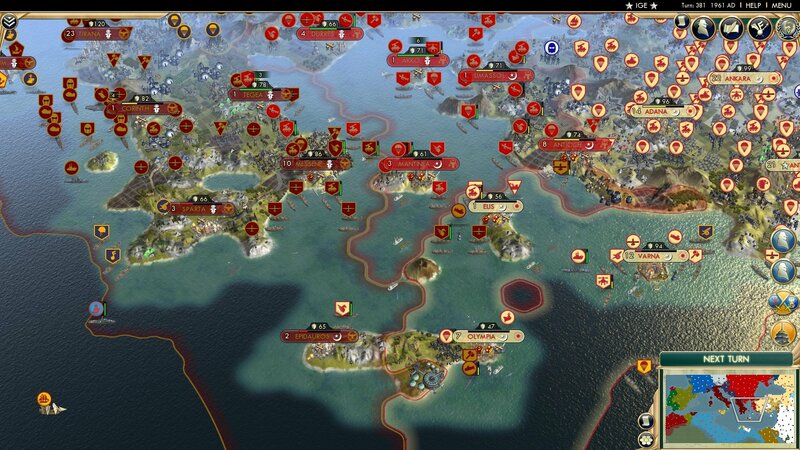 Oh my, the Moldavians declare war on Bosnia and capture Kruje. The Bosnians flip Kruje, and this slide is only here to pinpoint the fact that the Israelis are now a Fascist Reich, becoming the people they once feared and hated. Moldavia recaptures Kruje, along with Sarajevo. 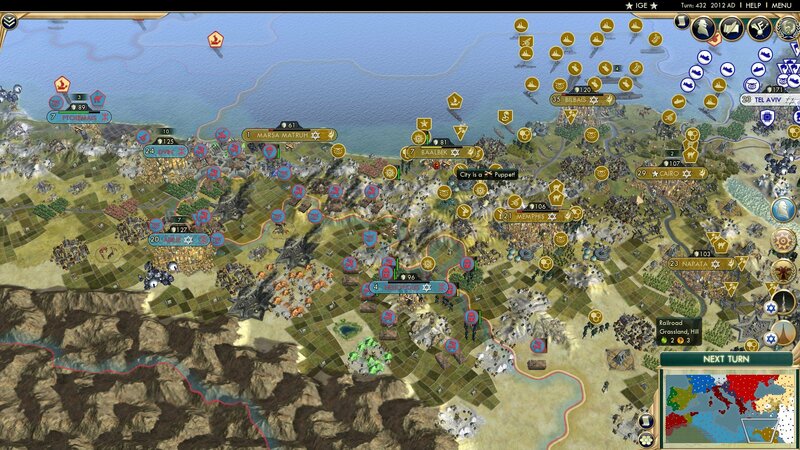 The Berbers capture Marsa Matruh. Return to former Yugoslavia to see Bosnia reduced to Jajce and Bobovac. And Vrhbosna. 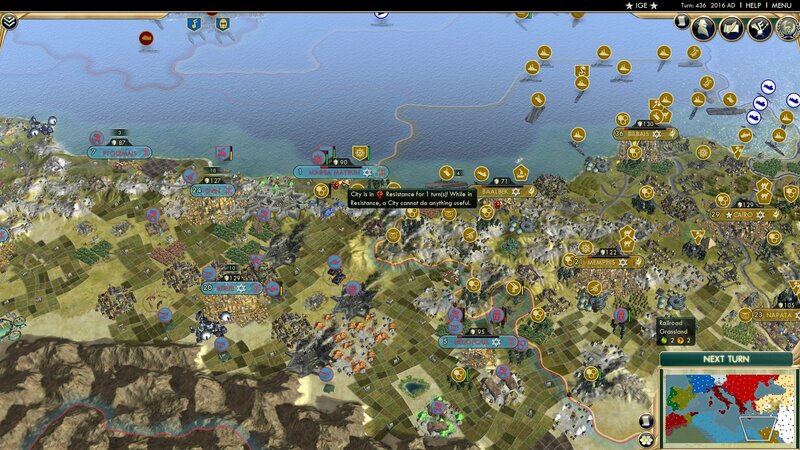 Egypt recaptures Marsa Matruh and Heliopolis, while the Iberians peace out with the Hittites. 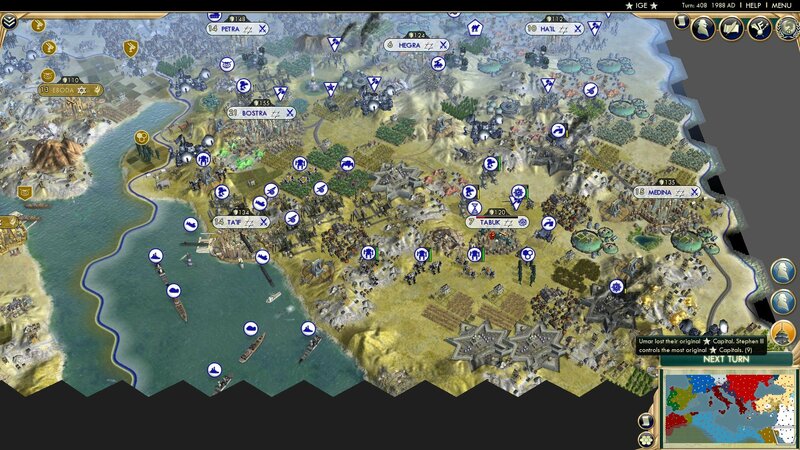 Offscreen, the Israelis produce the Floating Islands, which grant 3 culture and gold from nearby sea tiles, and atolls produce an extra 2 culture and gold, and 1 extra food and production. The Moldavians make peace with Bosnia after reducing Bosnia to only Jajce. That was quick. 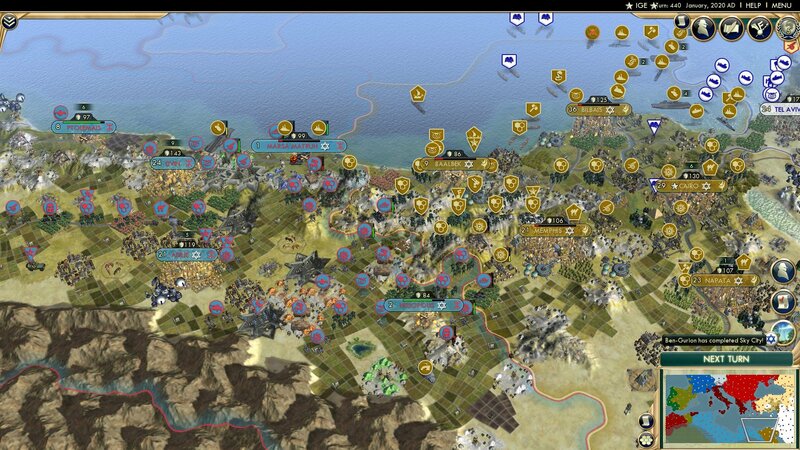 We end this part with the Berbers recapturing Marsa Matruh and Heliopolis. Both forces seem to be pretty equal, so more flips... Yay... Israel builds Sky City, which makes Vertical Forms (whatever those are) produce 4 gold and food and 2 happiness. Here's the poll, please vote in it, or don't, I'm not in a position of authority to force you to do so. 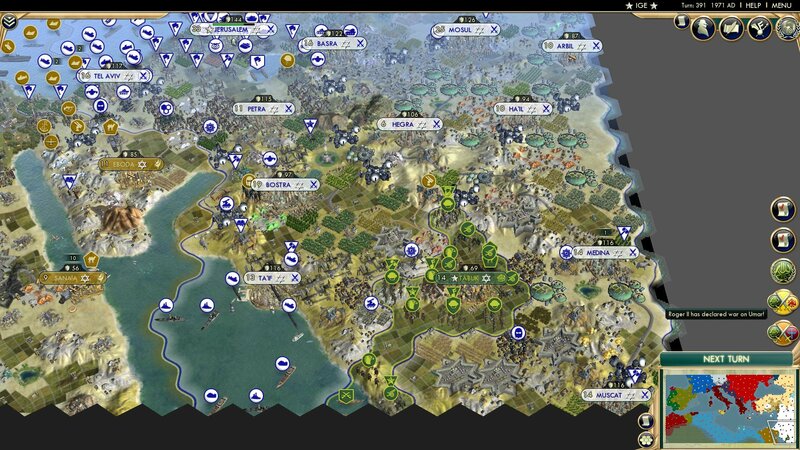 Moldavia, the Berbers, and Israel jump to the lead in score. Population stats. Everyone fits in this one slide! Military. France is still up there somehow. Techs. Israel is running away with it. Man, Israel has a huge science output lead.